Prayagraj, March 18: Congress General Secretary and in-charge of Eastern UP, Priyanka Gandhi Vadra will take a 3-day long Ganga-yatra' on a steamer boat, starting today. The Congress leader will take the steamer ride from Chhatnag in Prayagraj to Assi Ghat in Varanasi. Priyanka will travel for 140 Km to reach the city of ghats. During her journey, she will also meet elderly citizens of Dumduma in Prayagraj and the family members of Mahesh Raj Yadav, who was killed in Jammu and Kashmir's Pulwama on February 14 in a suicide bombing. 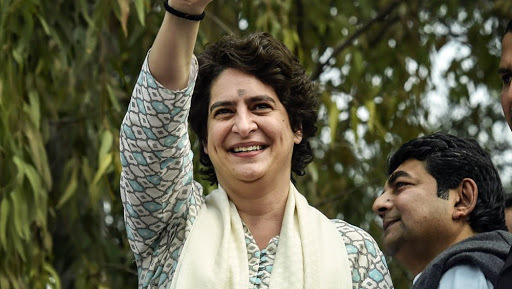 Priyanka Gandhi Vadra to Take 3-Day 'Ganga-Yatra' in Uttar Pradesh on March 18, Congress May Declare Varanasi Candidate After Her Visit Congress. The AICC general secretary will also visit Vindhyachal temple in Mirzapur and meet the carpet weavers before a night halt there. She will commence her journey on Tuesday from Vindhyachal and visit the Dargah of Maulana Ismail Chisti in Bhadohi's Kantit area and interact with people there. Priyanka Gandhi Vadra Writes Open Letter to People of Uttar Pradesh, Vows to Change Face of Politics. After performing rituals at the Vishwanath temple in Varanasi, she will again take the steamer ride to Dashashwamedh Ghat. After that, she will leave for the Congress office in Varanasi and interact with party workers during a Holi Milan programme. She will then leave for Delhi on Wednesday evening from Varanasi airport. Meanwhile, a day before starting her campaign from Prayagraj, the AICC general secretary wrote an open letter to the people of the state. In the letter, she said that she would take the help of “Gangaji” to reach their doorsteps to bring “political change”. Lok Sabha Elections 2019: Priyanka Gandhi Will Make No Difference to BJP's Poll Prospects in Uttar Pradesh, Says Yogi Adityanath. Priyanka also said that she would be interacting with people to understand the problems they are facing. Priyanka will also run a door to door campaign ahead of the Lok Sabha elections. In the letter, the Congress leader wrote, “Youngsters, women, farmers and labourers are in distress because of the stagnation in politics of the state. They want to speak out, but their voices have been lost... I know any political change cannot be brought in the state without listening to you all. Hence, I am coming to your door.” On Sunday, Priyanka held a meeting with party workers.